Temminck's Sunbird (f) Aethopyga temminckii Size 10-12cm I saw these Sunbirds on my first morning of birding and strived to take some nice pictures. But most of them were rather far so it was a struggle to get good IQ. My son and I decided to have lunch in the veranda of one of the restaurants when we saw these two sunbirds moving around at eye level. Its a good thing I had my rig with me. The male has a ring. I thought it usual that they are keeping track of even the sunbirds. I guess they take their records very seriously in Mt. Kinabalu. In fact there is a field guide that is very complete in the gift shop near the gate. They allow you to look at it. Its not for sale. But they do sell 4 or 5 other books on birds of the area. Amazing birding support. 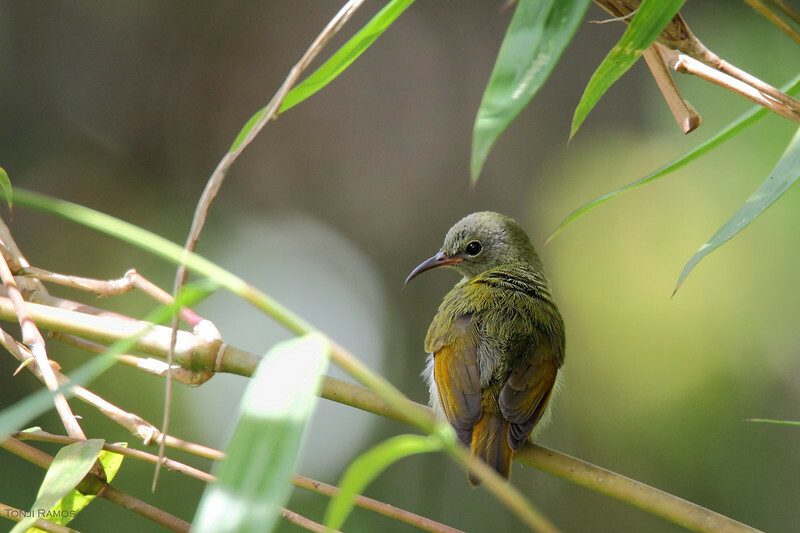 The male Temminck's Sunbird is bright red. The markings on the head are iridescent and change color depending on how the light strikes it. Sometimes its looks purple or blue sometimes it looks black. The female is olive green with reddish wings and tail. Fantastic looking sunbirds. Normally lunch time is a dead birding hour but on this instance it was quite rewarding. This bird was named after Coenraad Jacob Temminck (1778-1858), a Dutch naturalist who has 16 birds named after him. He also has some sharks, fishes, reptiles and mammals named after him.